Firefly is a 3U CubeSat that was developed at NASA’s Goddard Space Flight Center in Greenbelt. 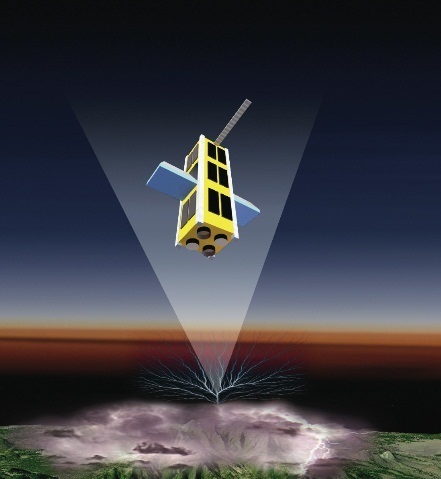 The satellite carries a scientific payload to study the relationship between lightning and Terrestrial Gamma Ray Flashes. Those TGFs are poorly studied. They are likely produced by beams of high-energy electrons which are accelerated in the electric fields of very large thunderstorm systems. Firefly will determine which types of lightning can produce these electron beams and TGFs. Monitoring even the weakest TGFs, Firefly will study the occurrence rate of TGFs. Knowing how TGFs are formed and how often they occur will lead to a better understanding of the Earth’s upper atmosphere and the near-Earth space environment. The prime instrument of the satellite is the Gamma-Ray Detector Instrument that uses a bismuth germanate scintillator system to measure the energy and time of arrival of incoming X-ray and gamma-ray photons that are associated with TGFs. Using a phoswich-style layered scintillator, the instrument can also measure high-energy electrons from several hundred keV to the MeV range in order to discover relativistic electrons that create gamma-ray emissions. The other instrument installed on the satellite is the VLF receiver / photometer experiment that combines multiple sensors to measure the Very Low Frequency radio waves that are emitted by lightning in the range of several tens of Hz to several kHz. Also, optical emissions from lightning are measured with very high-time resolution. These measurements corroborate the occurrence of lightning when enhanced gamma-ray or electron fluxes are observed. Also, using the instrument, the parent lightning can be pin-pointed and its characteristics can be measured. When the instrument detects lightning or a TGF with a strength above a threshold that can be ground-commanded, the system acquires 100 milliseconds of high-time resolution data from all sensors. Approximately 50 lightning strikes will be observed each day and about one large TGF every couple of days. The Firefly project involves extensive student involvement from a number of Universities and other participating institutions.